Attention foodies! This one’s for you. 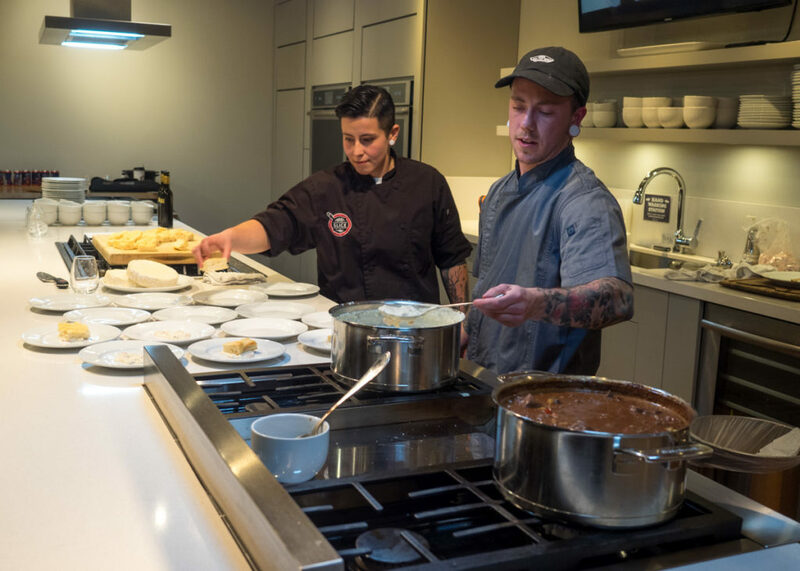 I attended the latest edition of Brews & Bites at SLICE (Salt Lake Institute of Culinary Education) where I was treated to an evening of exceptional dishes paired with beer from a local brewery. The spotlight brewery for March was Kiitos Brewing, winner of GABF (Great American Beer Festival) gold in their first year of operation. Kiitos beers served as both the inspiration and the canvas for the culinary works of art enjoyed by attendees of this fun, educational event. 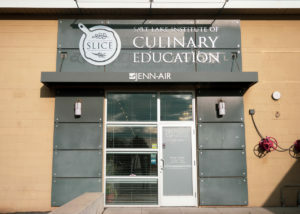 Entering the SLICE building is like walking into a big, beautiful kitchen or, perhaps, the set of a cooking show. The Institute is equipped to host all manner of cooking classes and events for those who are in love with and curious about food. 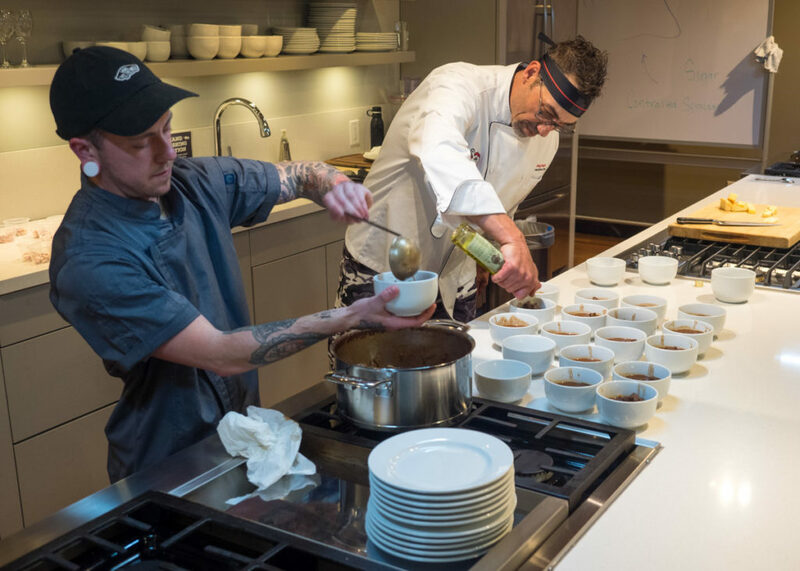 This they do with a full calendar of hands-on instruction, date nights, and gastronomical experiences for every level of foodie or cook. 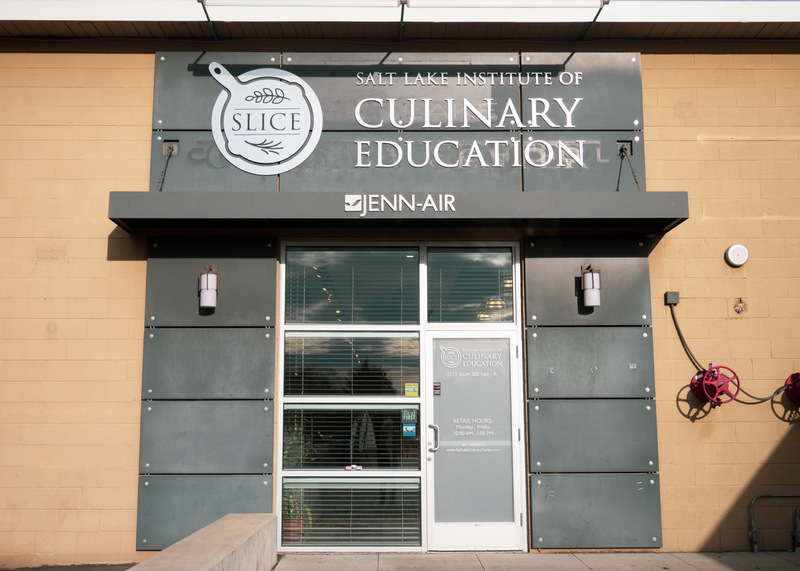 For those desiring a career in the culinary arts, SLICE offers a 12-week professional certification program to get you started. The third Thursday of every month is dedicated to the craft beer and food pairings of Brews & Bites. It was just the thing to reel me in and get me interested in coming back for more. Our instructor for the evening was Executive Chef, Greg Reith assisted by Kitchen Manager Brixton Taylor. Kiitos Brewing owner, Andrew Dasenbrock, talked about the beer selections. What was immediately clear to me was how much planning and preparation went into the evening. The chefs had tasted many of the 25 beers Kiitos makes in advance and carefully chosen their favorites to use in their pairings. Dishes were prepared before our eyes to complement and be complemented by each beer, and in some cases, the beer was incorporated as an ingredient. There were four courses accented by the occasional palate-cleanser. Each course was delicious and harmonized well with its beer companion. 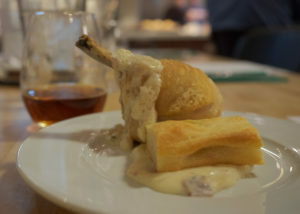 The first course was deep-fried lollipop chicken with bacon butter cream sauce and a sourdough focaccia made by a previous class. This dish was paired with Kiitos sweet-bodied Amber Ale. I loved the juiciness of the chicken and the way the creamy bacon sauce added a smokiness that went nicely with the toasted malt character in the beer. There was a nice play of sweetness and salt as the beer, chicken, and butter combined in my mouth. The sourness of the focaccia rounded it all out, and the beer bubbles did a good job of scrubbing the fat from the palate between bites. 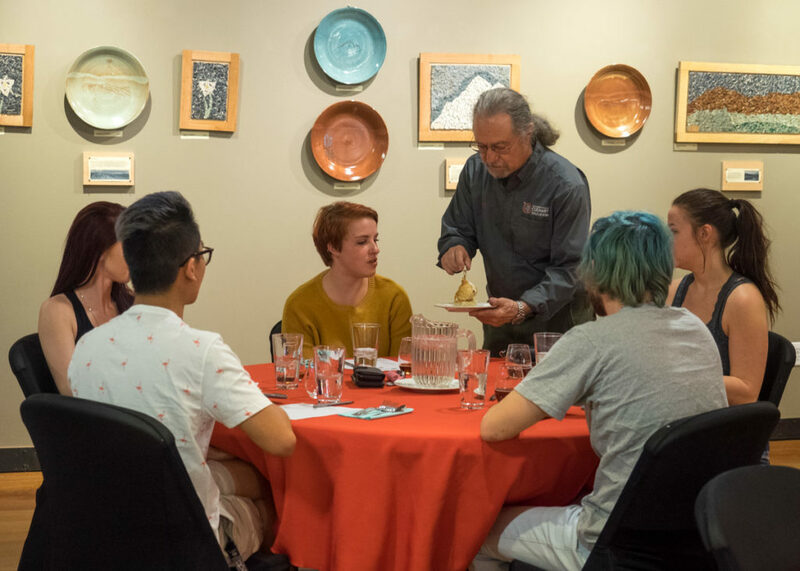 Course two featured a thick slice of brie over a croissant-like pastry pinwheel that was drizzled with coconut-infused balsamic vinegar and fungi-flavored olive oil. The oil and vinegar came from Millcreek Olive Oil, a Salt Lake City local. 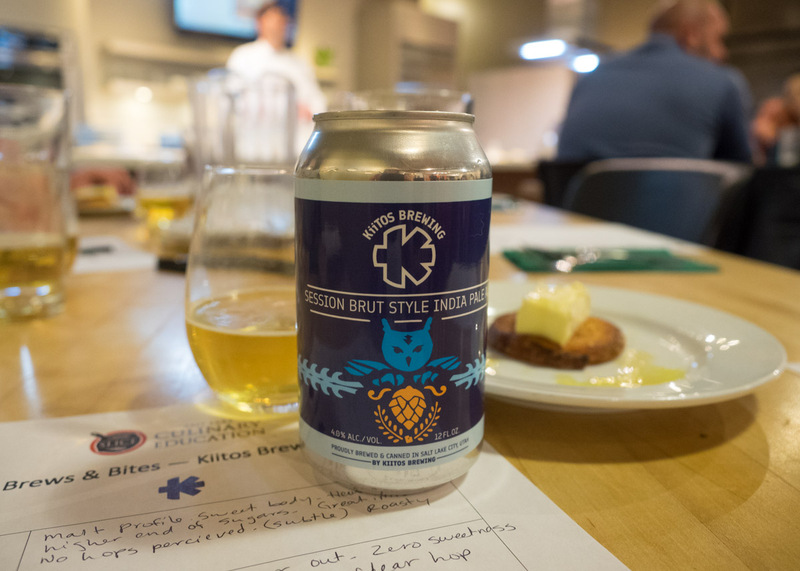 This course was matched with Kiitos Session Brut IPA, a light-bodied style that harbors no sweetness and exhibits vivid hop flavors. Tropical fruit hop notes in the beer blended spectacularly with the coconut of the balsamic vinegar, while hints of edible mold from the cave-aged cheese frolicked with the dusty fungus of the olive oil. A sourness in the cheese contrasted a slight sweetness in the balsamic vinegar. 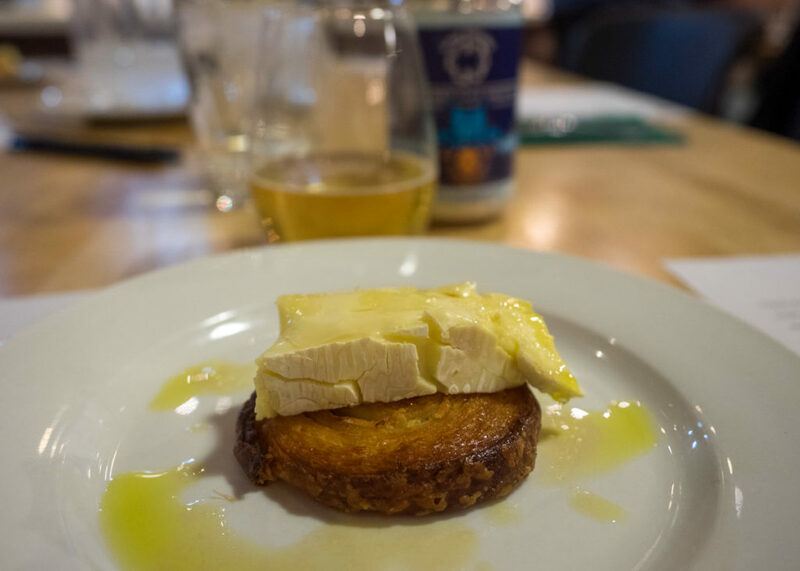 The delicacy of the beer didn’t overpower the food, and was a nice counterpart to its buttery texture. What comprised the third course was a pleasant surprise. To highlight Kiitos’ gold medal winning Coffee Cream Ale, the SLICE chefs whipped up a Beef Provençal full of root vegetables and an unexpected ingredient – dark chocolate! The chocolate was the element designed to pair with the coffee aspect of the cream ale. Also, coffee introduces tannins into the beer, like what you would find in wine. 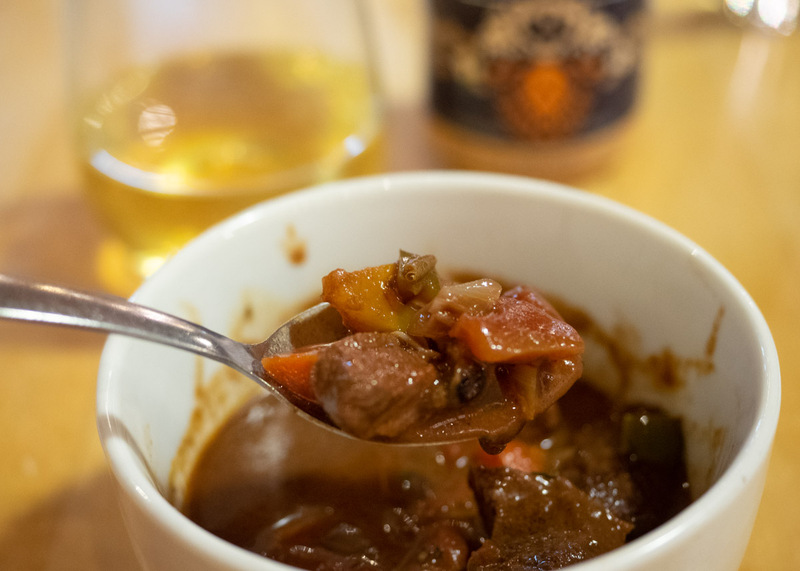 I enjoyed how the richness of the beef stew accentuated the light, creaminess of the ale. So yummy! For the final course, we were thoroughly spoiled with an amazing dessert. Kiitos Coconut Stout was invited to the party to reawaken the temporarily dormant coconut taste that still dwelt on our tongues from earlier in the evening. This beer was mixed with the Coffee Cream Ale to create a whole different chorus of flavors to delight our senses. These two beers were also used as ingredients in the dessert. 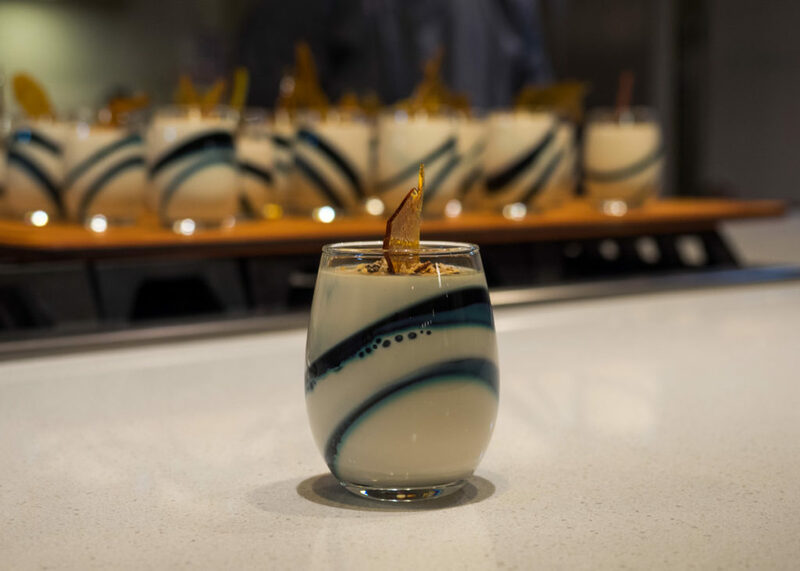 A creamy coconut stout panna cotta was swirled with coffee cream ale gelée. The yin and yang components were reminiscent of a black and tan. To provide a crunch factor, cocoa dusted almonds were combined with unsweetened toasted coconut and sprinkled on top. A sugar shatter (shard of hardened caramelized sugar) was added for an aesthetic effect. It was a tasty exclamation point at the end of a satisfying night. 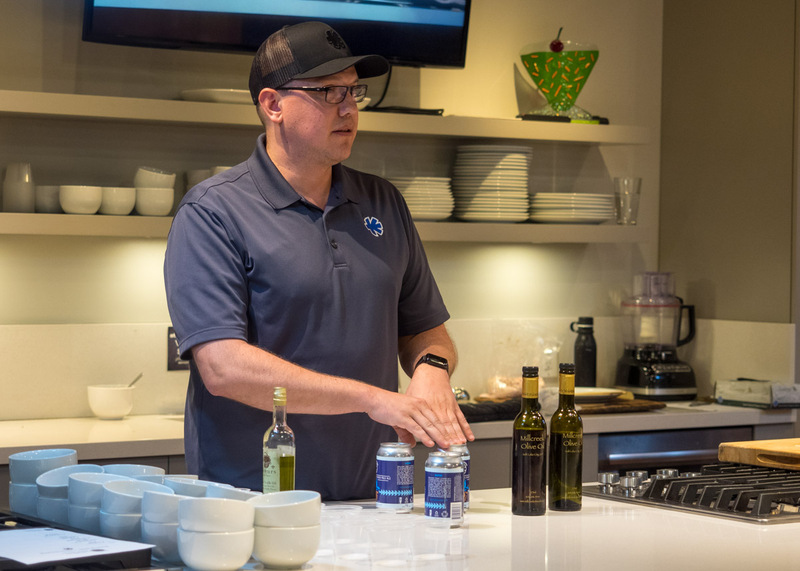 In addition to scrumptious dishes and good beer, Brews & Bites also offered an educational ingredient to the occasion. 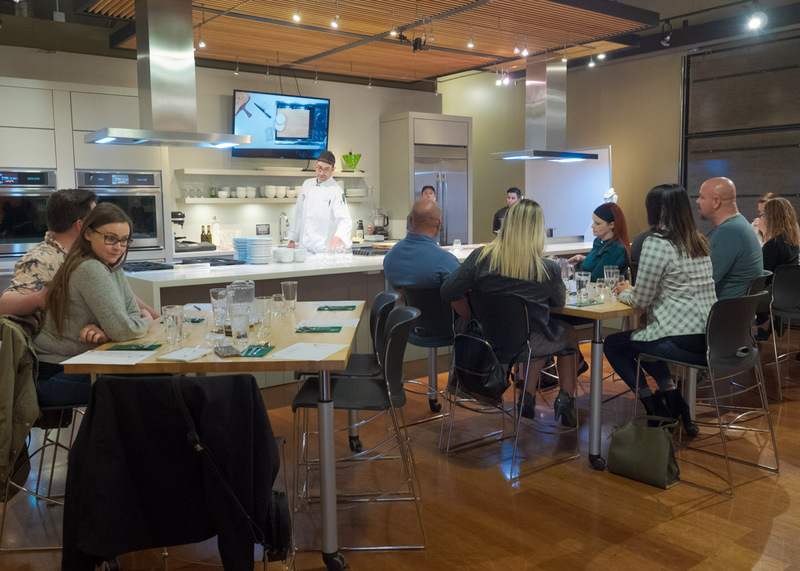 Chef Greg explained how an open mouth while smelling your food and drink leads to a fuller aroma. I found this to be true as I tested the theory for myself. He also talked about the concept of “controlled spoilage” as it relates to fermentation of beer and sourdough bread, aging of cheese, and even the roasting of coffee and cocoa. It’s an important factor in so many facets of what we eat and drink. If you’d like to join the party, visit the SLICE website to sign up for your place at the table. April will feature a whole new menu and beer from Moab Brewery. This interactive, satiating, educational event is just what the beer lover – and foodie – ordered. Please visit our Facebook Page for a full photo gallery.